Each year at Summit Racing Equipment Atlanta Motorama you'll find people gathered around pinstripers like Larry Conway as they display their mastery of the craft. "It's fun, interesting, and the thing that I like is little kids. Little kids are so interested in it which to me is rejuvenating," Conway said. "It's good to see the young guys are interested in an art form like this." Conway and the rest of the pinstripers have a talent for taking pretty much any object with a hard surface and turning it into a one-of-a-kind work of art. "There's different things you can do," Conway said. "Basically you put your outline on it first and then go from there. "You don't think about your next step you just take it, and that's kind of what this is. You've just been doing it for so long." In Conway's case, that's 47 years' worth of brushstrokes. "47 years - I learn something new every day. Every day," Conway said. "Cause nothing is the same. There's always something different somewhere down the road." Naturally, with so much experience with a brush, Conway takes pride in his work and always looks forward to showing what he can do alongside other pinstripers at Summit Racing Equipment Atlanta Motorama. "Motorama is - to me it's the Woodstock of car shows. It's so good to see my friends, other stripers," Conway said." They've got a phenomenal show. Anything you can think of generally is there. That is the highlight of my year." Over the course of two days pinstripers like Conway take all sorts of odds and ends and give them the pinstriper treatment at Motorama. Each piece is then auctioned off - the proceeds go to Speedway Children's Charities, furthering its mission to help children in need. "It's a great thing that we can help people," Conway said. "The fact that we can help in some kind of minute way makes me smile… there's so many kids out there that need help from whoever and just to be able to be a part of this makes my heart beat. "We do good work for a good cause and I would love for everybody to come out and see what we do." 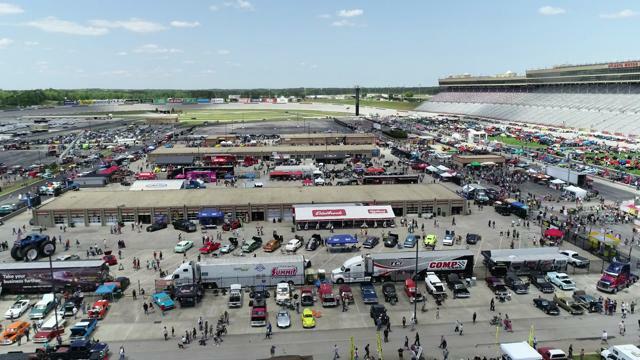 You can see Conway's creations and so much more when Summit Racing Equipment Atlanta Motorama returns to Atlanta Motor Speedway April 27th and 28th. Spectator tickets are priced at $15 per day or $20 for a two-day weekend pass; kids ages 12 and under get in free! Admission includes access to all areas of the show including the vendor midway, the Georgia Lottery Million Dollar Salon, extreme motorsports and much more.